This is a long-awaited return to Venice and to Peggy Guggenheim’s museum of Tancredi Parmeggiani (1926-1964), among the most original and passionate Italian painters of third quarter of the 20th century, and the only artist after Jackson Pollock to be put under contract by Peggy Guggenheim, who promoted his work and arranged exhibitions, including a solo show in her Venetian residence, Palazzo Venier dei Leoni in 1954. More than sixty years on, Tancredi returns to Palazzo Venier dei Leoni with this retrospective exhibition which, through a selection of exceptional paintings, reconstructs the brief and convulsive career of this great postwar artist. 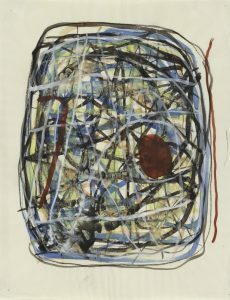 From his early years at art school to his first essays in lyrical color, from his personal contributions to the Spatialist Informel and his mature work of gestural abstract marks, down to the visionary style and content of his imagery in the 1960s, characterized by a troubled and tormented figuration. The exhibition includes a rich group of paintings from both the Peggy Guggenheim Collection and the Giorgio Bellavitis donation to the Solomon R. Guggenheim Foundation in 2000, as well as paintings given by Peggy Guggenheim herself to important museums in the United States, such as the Museum of Modern Art, New York.